"Tessa Hulls is a neuron igniter. 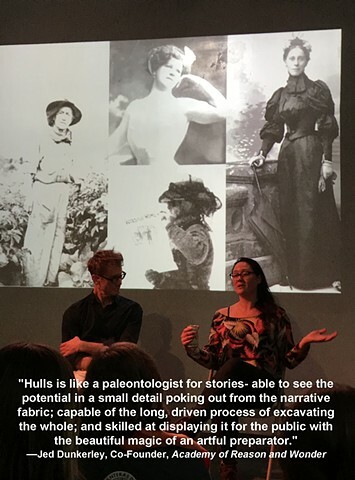 Weaving together history, humor, illustrations, and exhaustive research, she brings to life in her talks corners of human and natural history you never knew you cared so deeply about. Tessa's presentations float in a delightful nexus of narrative, comedy, art show, lecture, with the prowess of your all-time most entertaining dinner party guest, defying boxed categorization by any one form. You leave a Tessa talk sizzling with curiosity, appreciation for the unnoticed and unseen, and alive to the possibilities of stories all around us." As a narrative-based research dork who believes that history has the power to inspire us into contemporary action, I give lectures that delve into hidden stories through a fusion of hand-drawn illustrations, historical photographs, and humor. I'm currently a member of the Washington Humanities Speakers Bureau with a talk titled She Traveled Solo: Strong Women in the Early 1900's. If you're interested in booking me for this talk, please follow the instructions on my speaker page. I'm also traveling with Women, Trans and Femme Riders in Early Cycling History, which looks at America's 1890's bicycling craze through the lens of gender and race. This talk highlights the exploits of some incredible women, but it also provides the darker—and necessary—context that explains why contemporary cycling culture is dominated by men. You can contact me directly if you're interested in this talk.